Book reviews are pretty much always a disappointment. No matter how positive the reviewer is, it’s hard not to wish they had lavished even more praise on the book than they did. And even when a review is very positive, the pleasure in reading it can still be diminished when the author doesn’t seem to appreciate what the book is actually about. It’s surprising how often that happens, even in academic journals. Still, a positive-but-misinformed review is generally preferable, in my opinion, to a bad review of any kind! It’s been extremely gratifying to see that the response to Churchill and Sea Power has been very positive. Reviews come in all shapes and sizes these days, especially when the publisher, as in this case, is generous in distributing review copies. The earliest reviews to appear were on the LibraryThing website (www.librarything.com/), something I was not previously familiar with. Evidently, the publisher had supplied around 50 advance review copies to the administrators, who arranged to distribute them to their members on a first-come-first-served basis. The goal, as I understand it, was to generate advance interest in the book. From my perspective, the reviews, posted online, were a bit of a mixed bag. On the one hand, there doesn’t seem to have been any screening process involved, so many of the people who reviewed the book had little background knowledge of the subject, and in some cases no real interest in it – and their reviews were generally brief and uninformative. On the other hand, there were quite a few thoughtful and perceptive reviews that ended up there. In any event, it was nice to see so much early feedback on the book. The next wave of reviews were on Amazon.com and similar sites. These were also a bit of a mixed bag, but in this case the writers had purchased their copies, and this seems to have weeded out people who were not genuinely interested in the subject matter. Criticisms tended to fall into two categories. The first was that I had been too easy on Churchill. The second was that I hadn’t devoted enough (or any) attention to a particular subject that the reviewer had been especially interested in. In my own defence, I can only point to the fact that I had limited space to work with, and not every subject could be examined in detail. This is especially true of naval operations, which simply could not be examined at length in a book focused on grand strategy. Still, the feedback was quite favorable overall. And some of the reviews were clearly written by people who were very well informed on the subject matter. I’m currently sitting at 4.6/5 stars on Amazon.co.uk and 4.1/5 on Amazon.com, which seems pretty respectable to me. Finally, after a few more months had elapsed, reviews began to appear in scholarly journals. This was more familiar territory. In most cases, the reviewers were scholars whose work (and often personalities) I knew – consequently, there were very few surprises. I could generally predict the tone of the review once I saw who was writing it. There were a few people I always knew would dislike the book, and they did not disappoint! But they were very much in the minority. The nicest surprises were the glowing reviews from high-profile scholars in the field who had no reasons to do me any special favours. And there have been a surprising number of these, beginning with a nice blurb for the cover of the book from Professor Eric Grove. This was all the more gratifying because Professor Grove is not an admirer of Winston Churchill. This was followed by, among others, a very perceptive review by Oxford Professor Nicholas Rodger in the Journal of Military History (probably the leading journal in my field), a short write-up by Andrew Lambert for BBC History Magazine, and a detailed review essay by Matthew Seligmann that focussed in considerable detail on the first chapter of the book. 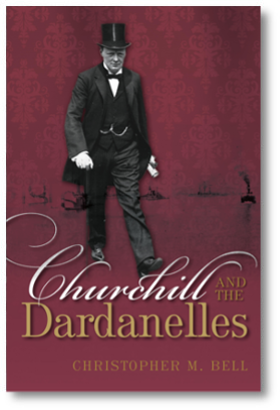 Besides naval historians, the book was also reviewed favorably by some leading military historians – including Raymond Callahan in the American Historical Review and Geoff Wawro – and by several Churchill scholars, including Christopher Sterling in Finest Hour (the journal of the Churchill Centre) and Richard Toye, author of three Churchill-themed books over the last decade or so.